The Tetiever Verein was later known as the Tetiever Social & Benevolent Society and in 1909, the year after the first Klausners arrived, it became a congregation named Tetiever Ahavath Achim Anshe Sfard. For more, see the ECH entry. In 1911 the Tetiever "shul" purchased a home at 2565 East 40th, just north of Woodland Avenue, and then converted it to a synagogue. 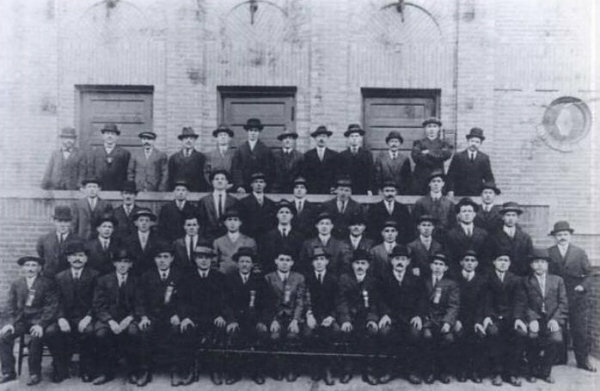 This picture, which appears on page 68 of Merging Traditions, the history of Jewish Cleveland, shows the founders standing in front of their new building. The caption on the back of the picture says it was taken in 1914 at the dedication of the building. We believe that Sam is seated in the front row, six from the right. The ribbon on his lapel suggests that he was an officer; not unexpected for at 46 he was one of its older members and a generous supporter. The building no longer stands. The land is part of a Cleveland public housing development. In the 1920's Jews began to move again. Most went northeast to Glenville. In 1926 the Tetiever congregation built a new structure at 954 Linn Drive in Glenville. Sam was a major contributor to the building and was president of the congregation around this time. Around the time the Linn Drive shul was being built, Sam, Minnie and their unmarried children also moved to Glenville and lived on Phillips Avenue, less than a mile from the synagogue. 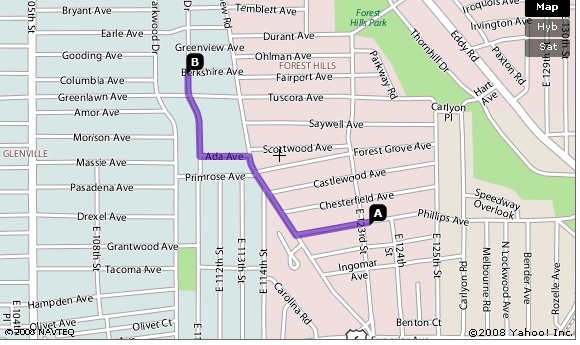 See the route from home to "shul" and their 1930 census record (lines 10-13). In 1957 the congregation would move to Warrensville Center Road in Cleveland Heights to form Warrensville Center Synagogue also known as Kehillat Yaakov. It has just moved to a new building on Cedar Road near Green Road. 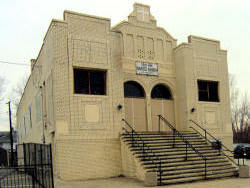 For the history of this synagogue, the core of which was the Tetiever shul, click here. The Linn Drive building, shown above in a recent photo, is now owned by the True Vine Baptist Church. In his home town, Sam had been a cooper - he made wooden barrels. He had a barrel-making business in the yard of his house, taught his older sons the trade and also employed others. In Cleveland Sam and his sons Nathan and Ben peddled used barrels. Then, some time before 1920, they formed Klausner Cooperage to manufacture barrels. It would soon employ son Jake, for a while son-in-law Issie Klotzman, and other relatives. With the leadership of the Klausner sons Ben, Nathan and Jake the business grew quickly - it was an American success story. For more on the family's main business enterprise, see Klausner Cooperage. Around 1925 Sam and Minnie moved from their home on East 51st near Woodland to this house on Phillips Avenue in Glenville, the city's newest, largest Jewish neighborhood. They probably bought their home soon after the "shul" decided to build on Linn Drive. Their youngest daughter Rose would graduate from Glenville High School and then earn a degree from Western Reserve University. 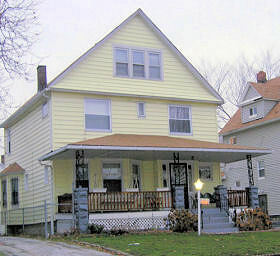 In 1936 Sam and Minnie moved to Silsby Road in the inner-ring suburb of Cleveland Heights. Minnie's oldest son Beryl Linetzky and his family lived in the Phillips Avenue house until 1947. I have a vivid recollection...of my twin sister and I coming to play "trick or treat" on Halloween on Grandpa and Grandma Klausner on Silsby Road and being doused with water from a hose by my grandpa because he did not recognize us and was tired of "trick or treaters" by the time we showed up (in costume). When we finally succeeded in making it clear that we were his twin granddaughters, he turned off the hose and hugged us dry. The walk from Tullamore Road to Silsby was quite a long walk for us. Every Sunday morning, Nathan, Ben, Jake and probably Abe and Harry all went to their parents house, with their children, not the babies, just us kids. The adults would talk business, of course, and all the kids got to play with all their first cousins. None of the wives were present. Then around noon all the wives would call the husbands to come home for lunch. This started when the folks lived on Phillips Avenue and continued even when they moved to Silsby. During the first half of the 20th century many Jewish immigrants and their children found their Orthodox congregations too restrictive. (Separate seating of men and women was often a major objection.) They also saw Reform, then in a period known as Classical Reform, too unfamiliar. By 1950 Conservative Judaism would be the largest form of organized American Judaism. By the 1920's, B'nai Jeshurun, which had been started in 1866 by Hungarian Jews and was originally Orthodox, had become a Conservative congregation and was no longer seen as the Hungarian shul. In 1926, when it moved to "Temple on the Heights", on Mayfield Road east of Lee Road, it became the first Conservative synagogue to build in the Heights and perhaps the nation's largest Conservative synagogue. More on B'nai Jeshurun. As the Klausner sons moved to the Heights, even before their children reached school age, they would leave the Orthodox Tetiever congregation. Son Nathan, an admirer of Rabbi Abba Hillel Silver, joined the The Temple - Tifereth Israel (Reform). Sam's other children, including Ben, Jake, Abe, Harry and Rose, would join Conservative B'nai Jeshurun. Only Minnie's son Beryl, who died while still living in Glenville and is buried in the Tetiever cemetery, and son-in-law Issie Klotzman, who owned a Kosher butcher shop, would remain Orthodox. When Sam and Minnie left Glenville for Cleveland Heights in 1936, Sam may have attended B'nai Jeshurun from time to time, but he maintained his connection to the old Tetiever synagogue, in whose cemetery section Minnie, and then Sam, would be buried. 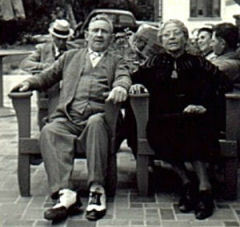 In the late 1930's Sam retired and he and Minnie moved to Miami Beach Florida. They lived what is today the renewed and very popular South Beach neighborhood. Their address, East 9th Street and Euclid Avenue, still brings a smile to Clevelanders who know East 9th and Euclid as one of downtown Cleveland's major intersections. 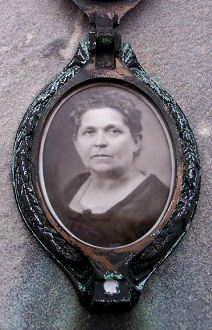 Minnie Klausner died on June 21, 1940, at the age of 75. 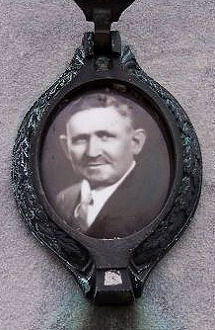 Sam Klausner died on July 30, 1945, at age 79. Sam's funeral service would be held in the Linn Drive Tetiever synagogue he had served as president. Sam and Minnie are buried in the Tetiever section of Ridge Road #2 Cemetery, at 3824 Ridge Road, Brooklyn Heights. They had the below-ground burial required by Jewish tradition. But after Sam's death some of his sons erected a mausoleum over their graves, without getting the permission of the congregation or the cemetery officials. It still stands today as the only mausoleum in the Ridge Road Cemetery. 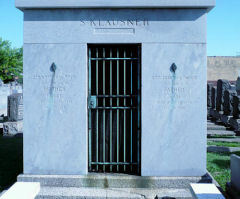 Though the mausoleum covers the graves of Minnie and Sam, it says simply S Klausner. See a list of those buried in the Tetiever section.